The ClickBank Pirate Review is another of my honest reviews carefully done on online money making opportunities as part of my mission to combat scams. My goal with this website is to help make the Internet as safe place to meet. The more we are to expose scams and frauds, the better it will become to browse the net. Is ClickBank Pirate a scam, or is it legit? As my regular readers already know, when investigating a business, a program or a service, I take days, weeks and even months to do my research. I interview people who are already members. Most of the time I join at the highest level of membership, or buy the product to use it myself. that they are genuinely helpful and honest. Then, I go through the comments of as many forums and websites as possible. It is only then that I put all this together to prepare my review. As for ClickBank Pirate, aka CB Pirate, you couldn’t get a more accurate review as I am an existing member of this money making opportunity. Yes, you read it correctly, I have been scammed myself. You will find out below how and why I joined ClickBank Pirate at the end of 2013. And how I fell in the trap and locked myself in for life. What is ClickBank Pirate, or CB Pirate? 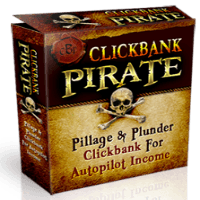 ClickBank Pirate or CB Pirate as we also know it, is a website that basically claims that they will be teaching you how to make a lot of money online. In reality what they do is teach you how to promote their own products using a number of banners, pre-written emails for your mailing list, and pre-written contents for your website or blog. The “training” consists of a number of recorded webinars teaching you how to create some one-page websites to promote their own products. The problem is that you will never have any traffic to these websites. Why? Because, as you may know, a one-page website or blog has very little chances of ranking well on Google and other search engines. So, what it means is that they teach you how to promote their own products in the worse un-organic way. Therefore, if you can’t get traffic to your websites and earn some affiliate income, what is left for you to do? … you’ve got it: SPAM ! Spam your mailing list, spam on social platforms, spam in any way you can! The ClickBank Pirate review – Scam or Legit? 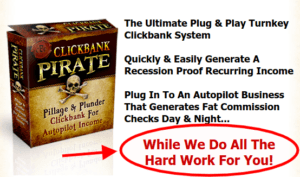 The ClickBank Pirate is widely advertised as a “turnkey affiliate marketing opportunity”. In the ClickBank Pirate membership are included WordPress websites that are pre-loaded with tools for you to use to help promote ClickBank Pirate. You may know that WordPress is an excellent, easy to use website and blogging platform. I use it myself as well and I can create stunning website in minutes, literally minutes. It does include hosting for your website. Also, free capture pages to encourage your visitors to leave their names and email address. Virtually everything that you should need to make “a lot” of money selling ClickBank Pirate is in your kit. Obviously, ClickBank Pirate is a product that is sold on the ClickBank platform, which we know is a very respectable marketplace for affiliate digital products. It has an excellent refund policy, so it is 100% safe to try ClickBank Pirate for a complete 60 days! What is in the ClickBank Pirate affiliate package? When something looks too good to be true, it usually is! The ClickBank Pirate affiliate program was created with one and only one goal in mind … to procure the affiliate with the necessary tools and to show them how to easily promote and sell ClickBank Pirate. The system is very simple: You are provided with a pre-loaded website with quite a few pre-prepared tools which link to your ClickBank Pirate’s affiliate home page where supposedly the sale for their “opportunity in a box” will be completed. Your task in this project is to capture the traffic from your website and to direct it to the ClickBank Pirate’s main website. ClickBank Pirate teaches marketing techniques that are totally out of date. Yes, in their time these techniques were more or less effective but have now lost a lot of their effectiveness, and would need to be reviewed. Personally, I have been making money online since 2001, therefore, I know when it is a great opportunity, and such situation would never happen with the nr. 1 money making opportunity opportunity I am involved with. You can read all about it here ~~> My #1 Money Making Opportunity! How did I fall in the trap and got myself locked in for life? Like most, I joined ClickBank Pirate following an offer to join and try the whole system for 30 days for about $5.00, then if I do not cancel within that trial period, I would pay one off $67, plus $37 per month thereafter. I found it a bit expensive, but I had 30 days to decide, and it was the 1st of January, and as we do at the start of each year, I wrote done a goal that by the end the 2014, I would be making a lot of money with this opportunity, as I was very much impressed with what I was seeing. I followed the training and embarked in a major marketing campaign. As always, when I start with a money making program, I put in all I’ve got and decide later if it is good or not. So, that’s what I did. 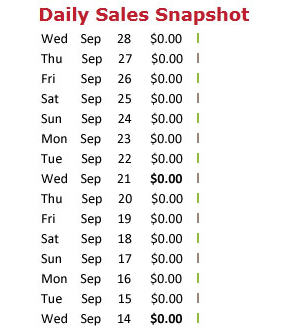 Then, mid-way into my 30 day trial, started to pour in up-sells. Including a very attractive one: If I would like to change my membership from monthly to a lifetime it could be done for “ONLY” $265! A quick calculation showed me that in less than 8 months, it would become free to me. By experience, I know perfectly well that, just about any business requires at least a year to become profitable. So, if I were to become profitable, and not paying anymore fees, it would be the deal of the year, right? After a few months I couldn’t understand why I was getting so much traffic and was not making any sales, I became suspicious that something wasn’t working correctly. I subscribed a few “fake” members under me, but somehow, they would not show in my down-line. As a result, I would receive the automatic followup emails and offers. I upgraded one of them to the 30 day trial, but was never credited for that upgrade. So, if I wasn’t receiving my commissions, who was? And worse, how many sales have I already made and never got paid for? And this went on for months! That’s when I became seriously suspicious and opened a support ticket and got a response from Cindy Battye saying that David would look into it as soon as possible. Weeks went by and no response, so I wrote again, and again, and again. Response: “Dave promisses to look into the issue soon”, “this weekend”, “he doesn’t see any problem, all is working normally”, etc. I had to stop all paid advertisements then, till this problem was resolved. Then, about 10 months later, Cindy suggested that I should close my account as they could not find anything wrong, and they would give me a new affiliate link. Which meant that whichever sales I had done so far would be definitely lost. Plus all the money I spent on advertising was wasted. I then requested a full refund and that we call it quit. The reply was that the 60 day trial period was long time over, so that was not possible. I opened a claim at ClickBank, but of course the reply was the same. So, I had no choice but to continue, but this time with much less faith and energy. That said, although the system is out of date, I still believe that the ClickBank Pirate opportunity could be a good stream of income, provided the affiliate link works as it should. The question is, whether this happened only once, and to me; or is it done on purpose to a number of affiliates? You can be the judge if you wish. Is ClickBank Pirate, or CB Pirate a Scam? I shouldn’t think so! Although I never had any direct contact with David Blaze nor Soren Jordansen, I was only in contact with Cindy Battye a lot during the problem I had. She was very helpful and extremely patient. Is it worth a try? Yes, as long as you make sure that you keep a close eye on what’s going on before deciding to upgrade to a lifetime member. Should you invest your time and money in the ClickBank Pirate program? To be honest with you, after my experience with it, I personally wouldn’t. If I were on the market for a money making opportunity long term, and had a choice, I would definitely go for the Wealthy Affiliate program. And, one thing that I should mention, is that if you decide to join Wealthy Affiliate, I will be available 24/7 to help you. Plus, you will have access to my private and FREE coaching. I hope that you enjoyed reading the ClickBank Pirate review. If you have any other tips in this particular field, my readers and myself would like to hear from you. And, should you have any problems, please make use of the comments box below. I will respond typically within 24 to 48 hours. If you enjoyed reading this article please share it socially and post your appreciation in the comments area below, I will highly appreciate it! Thanks very much for going through my “ClickBank Pirate Scam Review” Diane. I do appreciate you taking the time to post a comment and to support my views on this most wonderful money making opportunity that is Wealthy Affiliate. I would imagine that you are also a member of it and won’t be surprised if you were not a very successful entrepreneur as we all become in time. Please let me know what you think and make sure to share it on social media, this will help cripple these scammers, and hopefully, in time, get them out of business and restore the good name of affiliate marketing. Best wishes for 2019 Diane. Thanks for this review! Yet another scam… ClickBank Pirate is another one of them and it is unfortunate that is has the same name as a legitimate affiliate program, ClickBank University, only with the change of name to Pirate. I hope it doesn’t lead to confusion. It’s great to see that you have a very detailed overview at the beginning so people can see all the main information like your overall rating of 2/5 stars. Thanks for this great review, revealing the truth about ClickBank Pirate. Keep it up! Nice seeing you here again Kohl. It seems like you are enjoying reading my scam reviews and I thank you for commenting on them. That’s right, scammers are everywhere on the Internet. Thanks to people like me an many others, we are managing to bring their fraud actions to light so that one day, we hope that it will be impossible for them to make money online and they will either go out of business, or become honest and offer legit programs. I am longing to read what you think about them. In the main time, I wish you a very Happy New Year! I would love to read what your thoughts are Charles, and I wish you a very Happy New Year! Thanks for this honest review Jhon! The Clickbank product lately have been everywhere scamming people, they make spend a small fee to get started and then they bombard your inbox with endless upsells! As a Wealthy Affiliate member I think WA is the best alternative because it is totally free and they don’t have any hidden upsells or somthing so I highley recommend people to joing WA! Thanks very much for visiting my website and for commenting on my “The ClickBank Pirate Review – Scam or Legit” review Anis. I am glad that you are also a member of Wealthy Affiliate, and as you say, it is possibly the best money making opportunity to be involved with. It is for all levels of expertise in affiliate marketing thanks to its first class training course and unique support system. Just in case you have not done so yet, I invite you and my casual readers to signup for my newsletter here ~~> Newsletter so that you will be notified the minute a new article is being posted. I wish you the very best Anis, and I look forward to seeing you here again soon.